One thing about hippies in the Bay Area is that they never died out, but they have changed their vehicles. These days, the mid-80s Toyota Tercel is the spiritual heir to the beat-to-hell Volkswagen Transporter of decades past. While scrounging in the local self-service junkyard for bits for another junkyard-parts-based project, I ran across this mysterioso rear-view mirror charm in a 4WD Tercel. 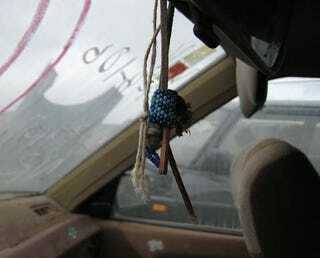 Did the owner believe this beads-and-leather thing would keep the ol' Tercel harmonically converged? These cars are perfectly suited for the hippie lifestyle; you can, like, totally space on all maintenance for years and it will keep going. The VW Transporter could sort of do that, but its primary appeal was that it could still function when running like crap (which, given the air-cooled motor's constant need for valve adjustments, it always did); the Tercel would keep running just fine even after years of fearful neglect. It's a safe assumption that this Tercel finally succumbed to the wear and tear caused by 50,000-mile oil and/or total inability to pass the smog check. But maybe the mirror charm bought it an extra 10,000 miles! Even a decade after Jerry's death, you still see all the rose/skull/bear iconography on these cars. But, whether owned by hippie or solid citizen, most cars have a date with the cold jaws of The Crusher... someday.